It was this day, March 7, back in 1967. 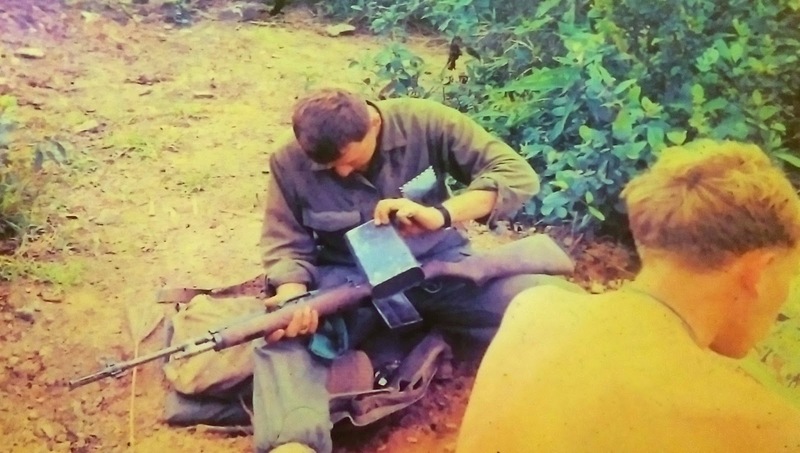 It was his 21st birthday and he asked his buddy to take this picture of him cleaning his M-14 combat rifle. He was in or near a place spelled Huế and pronounced "Way." Because he would spell the name Way in letters home, his mother became frustrated about being unable to find it on a map. It had once been the capital of Vietnam. The next year the place would be the site of the Battle of Huế and the Tet Offensive. He'd been in Vietnam for ten months, which gave him enough tenure to make life a little easier for a Marine. A person knew more than anyone who had been there a shorter length of time, even a day, in a situation where every day the motto was "learn or die." He tells me that in reality survival was "90% luck." The weather was beautiful that day, between 80 to 85 degrees Fahrenheit. The letter in his pocket had to have been outgoing... an incoming letter would show much more wear. Of the two Marines pictured here, only my friend made it back home alive. Three months later Prof. Ulichne was Stateside, the War in Vietnam behind him but always a part of him, even today, on his birthday, 48 years later.